Gloucester’s first public transport was horse trams, in 1887, then electric trams in 1904, immediately becoming municipal. Livery was crimson lake and cream, becoming battleship grey during WWI and remaining so until closure in early 1933. Interestingly, during WWI, track was ripped up from little-used sections and used to extend an existing route to Brockworth Airfield. A tram was then converted to pull railway trucks some 6 miles through the streets! Good job the route was virtually flat! Replacement bus services started in 1929, using a succession of Vulcan Duchesses and Thorneycroft BC’s (all, bar four, with normal control) , with Gloucester Railway & Carriage Works bodywork, the original tram livery being reinstated. Later on, four of the oldest Thorneycroft vehicles were, oddly, sent all the way to C H Roe in Leeds to have their entrances moved to the rear of the vehicles! On 12th June 1936, in a novel move, Gloucester Corporation leased their services to Bristol Tramways and Carriage Company Ltd. All vehicles in the Corporation fleet were officially transferred to the Bristol company from this date, although the actual transfer had already taken place in the April. As part of the agreement, the former 35 Gloucester Corporation vehicles did, however, continue to carry Gloucester on the side and bear the city’s coat of arms, a fitting reminder of the days of Gloucester Corporation Transport. In fact, the coat of arms continued on the agreed number of buses, right through nationalisation with the National Bus ‘N/Shadow Arrow’ logo, too, and on until Stagecoach West took over Western Travel’s empire in Gloucester, Cheltenham and Swindon, in 1993. Western Travel painted their buses predominately in blue, which brought some colour after the dreary red and greens which hitherto had covered the country and, in the early transitional days, still also bore the double ‘N’ Arrow. They inherited and continued to run Express services, some of which were seasonal, to such places as Bath, to Weston-s-Mare and to Coventry (via Stratford on Avon). They also ran a really long-distance one to Weymouth and it is on the seafront there where we see Bristol 2062 (WHW 374H), a 1969 dual-purpose Bristol RELH6L/ECW DP49F body in City of Gloucester dual vehicle colours at Weymouth Rally – June 2011. This example was never in dual-purpose colours, but sister-vehicles were and it has only just been painted in this livery, for a few months, as a tribute to Gloucester public transport. Note the Gloucester Coat of Arms as well as the shadow ‘N’ logo. I travelled on one of the type to Coventry on one occasion and found them very good for DP vehicles. Certainly better than my going to Weston-s-Mare on one occasion on a Leyland Olympian – 45mph for 70-odd miles on the M5, but with a good view from the top deck when we finally glimpsed the sea! By this time, these services were on borrowed time, what with vehicle and driver shortages; a shame really, for, in my experience, they were always well supported. As a coach enthusiast, after the ZF Reliance, the RELH is my favourite vehicle and whilst I have no problem whatsoever with the Gardner engine my preference is for the RELH6L. Having driven both, this is not purely an "enthusiast" thing. The featured vehicle had DP seating but many similar vehicles elsewhere had the very comfortable full coach seating, making them suitable for National Express – if not touring. As a student, I travelled many happy miles on such East Midland vehicles (both Gardner and Leyland powered) as well as the North Western and Ribble RELH6Ls with MkII (my designation) coach body. My first long distance REL6G "cruise" however was by West Yorkshire on Yorkshire Services from Sheffield to London. In old age, I now find myself with both musical and PSV connections in Gloucester. 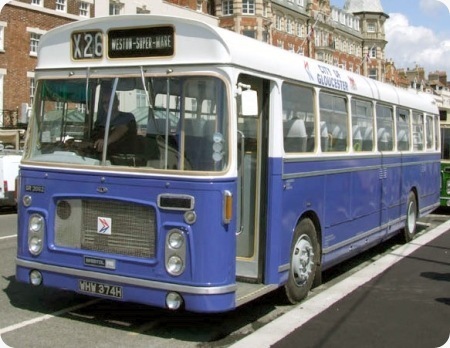 The RELH with ECW coachwork was really solid, quiet and comfortable vehicle to ride on but the early models with crash gearboxes combined with it’s rear engine took some time and practice to master rewarding when you got the knack. The ECW body had one major fault which became all too obvious the first time you had one on a busy express run with a load of luggage and it rained, there was a small luggage locker behind the engine with the door in the usual position at the rear when that became full the underfloor lockers had to be used the doors to which were quite shallow but heavy and fitted at the lowest part of the side panels which being within the wheelbase meant they collected all sorts of muck and water in the aforementioned rain which made opening them in those conditions unpleasant to say the least. The overall low build of these vehicles meant that even looking into the lockers let alone putting in or removing heavy suitcases was not good for your back muscles. The later Plaxton bodied had higher mounted and lighter locker doors which made them much easier to use and less dirty and painful. The later semi-automatic gearbox made them much more pleasant to drive, I too preferred the Leyland engined version.